Potamochoerus is a genus in the pig family (Suidae). The two species only live in Sub-saharan Africa. The Bushpig, possibly due to introduction by man, also can be found in Madagascar and nearby islands. 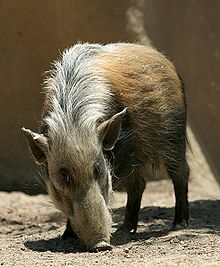 Red River Hog (Potamochoerus porcus). This page was last changed on 15 October 2014, at 09:16.